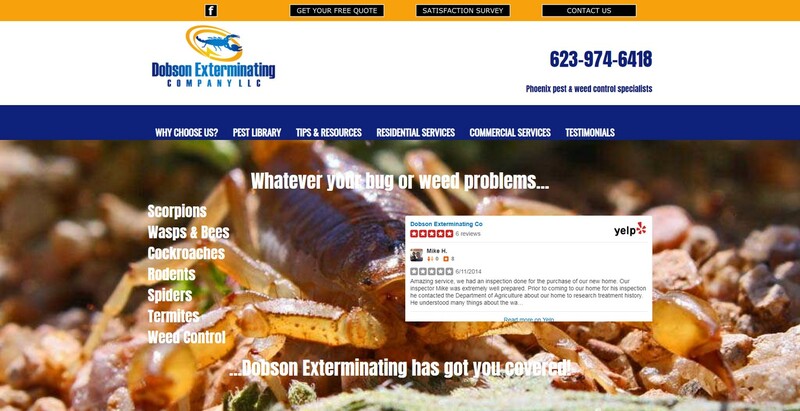 Probably only HVAC is more competitive here in Phoenix, so getting a great website together is a must for any pest control company. Dobsons already had a site built in Joomla (the platform we work in) and were referred by a fellow designer who specializes in Wordpress (thanks Toni!). Unfortunately, the previous designer was AWOL and the site backend hadn't been updated in quite some time. So the first step was updating the core and extensions to the current versions. We then did a complete rebuild of the site, adding more content and user interactivity. Recently, we gave the site a facelift, adding a customer satisfaction survey.